The Coin Conference organised the IACA Excellence in Currency 2017 Coin Awards in Warsaw on 24th October 2017. 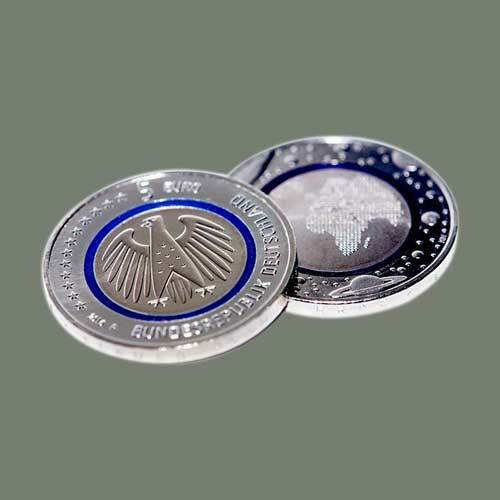 The Best Coin Innovation award was given to the State Mints of Baden-Wuerttemberg and the Bavarian State Mint. The winner was a tri-material 5-euro German coin with polymer ring. A polymer ring is put between the ring and the core for the first time to make it as secure as a banknote. The coloured polymer ring makes the coin look attractive as well. The developers claim that it is almost impossible to replicate this coin. The new polymer coin would raise the coin-note-boundary, which is being considered by many countries. The IACA brings together central banks and ministries of finance, mints, security printing companies, along with other institutions and companies from the banking sector. The IACA Excellence in Currency Award focuses on path-breaking solutions for the whole minting industry. The international jury for the award is comprised of experts. The same coin had won the Mint Directors Conference Award in the category ‘Technologically Most Advanced Circulating Coin’ in 2016. The German Mints were supported by the Leibniz Institute at the Rheinisch-Westfalische Technische Hochschule in Aachen along with representatives of the German Bundesbank. Other contributors were representatives of Crane Payment Innovations at Buxtehude and the blank supplier Saxonia EuroCoin.